U.S. and Iranian officials were saying little Tuesday about a controversy that has erupted over Iran’s choice to be its next envoy to the United Nations, as a member of the House Foreign Affairs committee said the Obama administration should not grant the Iranian diplomat a visa. Hamid Aboutalebi, 56, a career Iranian diplomat close to Iranian president Hassan Rouhani, told Iranian media in interviews last month that he had been summoned on occasions during the 1979 US Iran hostage crisis to serve as a translator, but was otherwise not involved. But Aboutalebi’s even remote alleged association with the embassy seizure and hostage crisis that traumatized Americans and ruptured US Iranian diplomatic ties over three decades ago has set off a flurry of denunciations from former US hostages, and some US Iran watchers say Iran should probably pick someone else. Congress also got involved on Tuesday, further complicating the administration’s calculus. Rep. Ileana Ros-Lehtinen (R-Fla.), the chairwoman of the House Foreign Affairs panel on the Middle East and North Africa, began drafting a letter requesting that the State Department deny Aboutalebi’s application, Al-Monitor’s Julian Pecquet has learned. The letter is expected to address other issues as well. US Ambassador to the UN Samantha Power may be asked about the issue when she testifies before the House Appropriations foreign operations subcommittee hearing on Wednesday. The irony, some Iran watchers say, is that Aboutalebi, a former Iranian ambassador in Australia, Brussels and Italy who currently serves as Rouhani’s deputy chief of staff for political affairs, is actually a reformist with strong ties to Rouhani who could have been an empowered envoy for advancing Iran’s international engagement at the all-important UN/New York post, much as Iran’s current Foreign Minister Mohammad Javad Zarif did when he served at the UN over a decade ago. “On the visa matter, I’m not optimistic mainly because it is an allegation that is as difficult to disprove as it is to prove,” DiMaggio added. The U.S. has apparently not decided what it will do on the matter, sources suggested. Iranian officials were circumspect about whether they expected the appointment to proceed. Aboutalebi visited the United States as a member of Iran’s delegation to the United Nations General Assembly in the mid-1990s, without incident, but was never previously full-time posted to the US, the Iranian official said. Hamid Babaei, the spokesperson for Iran’s mission to the United Nations, told Al-Monitor Tuesday that he had no comment. Aboutalebi, who joined the Iranian Ministry of Foreign Affairs in 1981 and who earned his masters at the Sorbonne and PhD in France, told Iran’s Khabar News online last month that he was not in Tehran when the US embassy was seized in November 1979, but was summoned later to translate on some occasions, including when the Pope sent an envoy to Iran to try to mediate in the hostage crisis. “I think that is one of the pluses, that he is close to Rouhani, [and serves as] political director of Rouhani’s presidential office,” the Iranian scholar said. Aboutalebi “is also very close to [former Iranian President] Khatami.” During Khatami’s administration, Aboutalebi served as a top advisor to then Iranian Foreign Minister Kamal Kharazi. –Al-Monitor’s Julian Pecquet contributed to this report. Iran and six world powers may hold the first round of negotiations to seek a comprehensive Iran nuclear deal in New York in mid-February, a U.S. official and Iranian media reports said Monday. However,an Iranian official said Monday that the parties are still working on both a place and the dates for the meeting. “It is our understanding that the first round of comprehensive negotiations will be in New York in mid-February with dates still being confirmed on schedules,” Marie Harf, State Department deputy spokesperson, said by email Monday. The last three rounds of high-level P5+1/Iran nuclear talks that secured a six-month interim nuclear deal on November 24th took place in Geneva. But Syrian peace talks that got underway in Geneva last week may continue to be regularly convened for months at the UN headquarters in Geneva, diplomats earlier suggested. It was understood that Iranian Foreign Minister Mohammad Javad Zarif’s team suggested to P5+1 counterparts last fall that the nuclear negotiations take place in UN cities, such as Geneva, Vienna and New York. European Union foreign policy chief Catherine Ashton was reported to have met with Iran’s President Hassan Rouhani and Foreign Minister Zarif in Davos last week to confer on the upcoming negotiations for a comprehensive nuclear deal. An EU spokesperson said Monday, however, that he did not yet have confirmation of the venue or dates for the next meeting. An Iranian official too, speaking not for attribution, said the venue and dates of the meeting are still being worked on. Zarif, who previously served as Iran’s envoy to the UN in New York, met with Ashton and P5+1 foreign ministers on the sidelines of the opening of the UN General Assembly last September. US and Iranian diplomats also met quietly in New York in the run up to UNGA in September, including to discuss arranging the September 26th one on one side-bar meeting between US Secretary of State John Kerry and Zarif, and the historic phone call between US President Obama and Iranian President Hassan Rouhani, Al-Monitor previously reported. Geneva_ World powers and Iran seemed to be closing in on a deal as US Secretary of State John Kerry and other P5+1 foreign ministers said they would join talks in Geneva on Saturday. Kerry’s travel plans were announced after the arrival here Friday evening of Russian Foreign Minister Sergei Lavrov. UK, French and German foreign ministers also announced plans to come Saturday. China’s vice foreign minister has been here all week, and its foreign minister was reportedly also heading to Geneva. Talks ran til almost 2am Saturday, on the third day of the third round of high level Iran nuclear talks here in Geneva in the past five weeks. European Union foreign policy chief Cathy Ashton and her team have been running point between the Iranians and the P5+1 over the past couple days, to try to keep the process at this sensitive stage as coordinated as possible, with so many parties involved. Kerry and European foreign ministers were expected to arrive here Saturday morning, when talks will resume. Will Iran go big in Geneva? img class=”alignnone” alt=”” src=”http://www.recorder.com/csp/mediapool/sites/dt.common.streams.StreamServer.cls?STREAMOID=bdH4IVCTORK9hP0yivIAys$daE2N3K4ZzOUsqbU5sYvRaI2fZFCyu3NwSYv15WjAWCsjLu883Ygn4B49Lvm9bPe2QeMKQdVeZmXF$9l$4uCZ8QDXhaHEp3rvzXRJFdy0KqPHLoMevcTLo3h8xh70Y6N_U_CryOsw6FTOdKL_jpQ-&CONTENTTYPE=image/jpeg” width=”561″ height=”351″ />Some current and former western diplomats said Friday that they think Iran plans to put a broad and substantive offer on the table at nuclear talks with six world powers in Geneva next week, even as Iran’s top diplomat took to Twitter Friday to urge patience amid mounting speculation about what Iran may propose. There's some expectation that Iran could present a broader, “more coherent and better articulated” proposal than previously, a western diplomat, speaking not for attribution, told Al-Monitor Friday. Among the elements it is thought that Iran's proposed package could include, he said: suspending 20% uranium enrichment, and reducing its 20% stockpile, probably by continuing to convert it to oxide; limiting the number of centrifuges enriching, if not installed. It may offer to freeze the situation at the Fordo enrichment facility, built inside a fortified bunker, or switch cascades currently enriching to 20% to 3.5% there. It may also express willingness to accept more safeguards and monitoring by the International Atomic Energy Agency (IAEA). 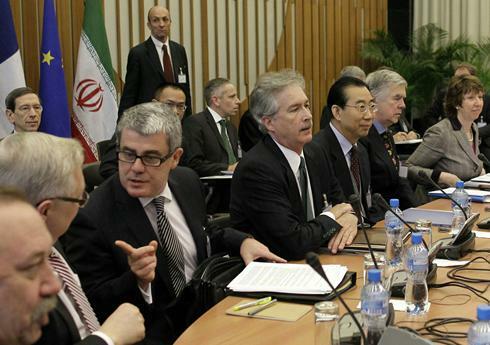 In return, Iran is expected to ask for substantial sanctions relief, including finance and oil-related sanctions. “My understanding is that Javad Zarif will…lay out a plan that will basically say, ‘Look, we want to do what is necessary, beginning now and ending in a year’s time, to assure everybody here that we don’t want… a nuclear weapon,’” William Luers, a former veteran US diplomat who directs The Iran Project, told journalists on a press call Friday. As near term steps, Luers said he thought Zariif would suggest that Iran is “prepared to either cease or reduce substantially” 20% enrichment, “do something serious about Fordo, short of locking it up,” and to agree to not bring on-line new centrifuges. He also anticipated Iran would offer to provide more access to the IAEA, as well as to take some unspecified action on the Arak heavy water reactor that Israel fears could give Iran a second route to acquire fissile material that could be used in a nuclear weapon. Former US Ambassador to Iraq and Afghanistan Ryan Crocker, however, urged lowering expectations about what Iran brings to Geneva, given his past experience, which includes negotiating with the Iranians in Geneva in 2001 and in Iraq in 2007. “While I would like to think that the P5+1 talks with Iran are going to result in a concrete Iranian proposal on what they are prepared to do, but given the history of these talks, and multilateral diplomatic efforts generally, I am not overly optimistic,” Crocker said on the press call Friday. Crocker said he thinks it’s more likely that Iranian negotiators in Geneva will say–much as they did in New York last month–that “Iran does not seek a nuclear weapons program. That it insists on its right to a peaceful nuclear energy program under international oversight. And that it insists on its right to enrichment at levels that are internationally acceptable,” he said. “If we get much beyond that, I will be pleasantly surprised,” Crocker said. He said he thought more progress could be made in direct talks between Zarif and US Secretary of State John Kerry than in the seven-nation talks between the P5+1 and Iran. In a potentially dramatic turn of events, Russia on Monday announced that it would immediately urge Syria to turn over its chemical weapons to international control as a way to avert U.S.–led military strikes. “We are calling on the Syrian leadership to not only agree on placing chemical weapons storage sites under international control, but also on its subsequent destruction and fully joining the treaty on prohibition of chemical weapons,” Russian Foreign Minister Sergei Lavrov said at an emergency press conference in Moscow Monday, following meetings with Syria’s visiting foreign minister Walid al-Moallem. Lavrov said he had “already handed over the proposal to al-Moallem and expects a quick, and, hopefully, positive answer,’” the Associated Press reported. Moallem, speaking from Moscow on Syrian State TV shortly later Monday, said Syria welcomed the Russian initiative. But it was not immediately clear from his reported comments whether “welcoming” the proposal constituted acceptance of it. “The Syrian Arab Republic welcomes the Russian initiative, motivated by the Syrian leadership's concern for the lives of our citizens and the security of our country, and motivated by our confidence in the wisdom of the Russian leadership, which is attempting to prevent American aggression,” Moallem was quoted as saying by ITV News. The surprise turn in developments followed U.S. Secretary of State John Kerry telling reporters in London Monday that Syria could avert strikes only if it agreed to turn over all of its chemical weapons by next week. “But he isn’t about to do it, and it can’t be done, obviously,” Kerry added. Kerry's remark–subsequently downplayed by State Department spokespeople as merely “rhetorical” and “hypothetical,” and characterized by another unnamed U.S. official to CNN as a “goof”–was followed by a telephone conversation between Kerry and Russia’s Lavrov Monday, the Russian Ministry of Foreign Affairs said. The Russian proposal emerged just as the White House is ramping up its public outreach as it presses Congress to vote to authorize the President to conduct limited military strikes to deter chemical weapons use in Syria. President Obama is scheduled to give a half dozen television news interviews on Monday, and to give a prime time address to the nation Tuesday night at 9pm ET. U.S. officials reacted to the news out of Moscow with skepticism Monday, suggesting it may be a stalling tactic, but promising to give the Russian proposal a “hard” look. It's “even more important” that the United States doesn't take the pressure off Syria now, White House spokesman Jay Carney said at the White House press briefing Monday. The Russian initiative is “explicitly in reaction to [the] threat of retaliation” by the United States. Notably, amid the official expressions of skepticism, former Secretary of State Hillary Clinton, speaking at the White House Monday after a meeting with President Obama, reiterated the conditions under which such a deal might be feasible. Initial reaction from the Hill ranged from cautious to skeptical—but did not entirely shut off openness to see if the Russian proposal pans out. “While at this point I have healthy skepticism that this offer will change the situation and it will be several days before we can fully determine its credibility, I do know that it never would have been floated if the Senate Foreign Relations Committee had not approved the authorization for the use of force last week,” Sen. Bob Corker (R-Tennessee), the ranking Republican on the Senate Foreign Relations panel, said in a statement Monday. “We shouldn’t get our hopes up too high,” Sen. Carl Levin (D-Michigan), chairman of the Senate Armed Services Committee, said.